I’ve been having a bit of a stressful time for the last few weeks. Nothing too dramatic, but my time in Korea will be wrapping up before I know it (three months left, but I suspect the fall will fly by) and it’s time to start getting things in order for my life post-Korea. Getting things ready to leave Korea is, perhaps unsurprisingly, proving to be just as difficult as getting ready to come to Korea. Fortunately, last week was Chuseok, which is a bit like Korean thanksgiving. The actual holiday was Tuesday, Wednesday and Thursday, but my school was also closed on Monday. This meant that we had a whole six days off. I considered using my time to travel within Korea a bit, as there are still a few places that I would like to see. However, Chuseok is one of two major holidays in Korea. It is the time when EVERYBODY leaves Seoul and goes to their hometowns to visit with family. It is not the time to travel in the country if you can avoid it. Instead, I went to Taiwan. My plan was to stay in Taipei the first night, get rested up, and then head to the South-East coast and do some hiking. I arrived in Taipei early Saturday afternoon. And then this happened. 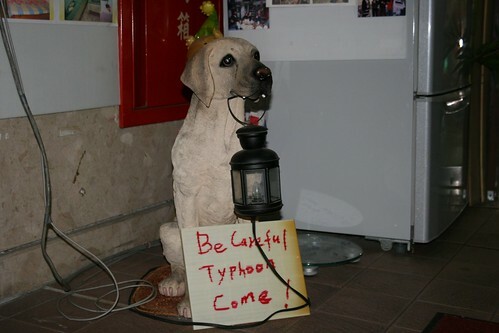 Typhoon Fanapi hit the Eastern coast of Taiwan On Sunday, flooding many towns and cities in the southern parts of the country, closing down airports, cancelling trains and generally causing havoc for most of the country. 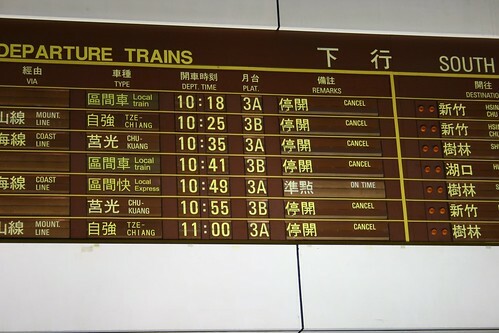 I was unable to get out of Taipei on Sunday, although I spent most of the day trying to. The staff at the train station first told me that trains would be running in the evening so I spent most of the day shuffling between the train station and the adjacent bus station, trying to find a way out of the city. Late in the afternoon I admitted to myself that I would not be leaving Taipei that day, and that there was a chance I would not be able to go south during this trip. So I checked into a hostel for a night and formulated my plan B. On Sunday night I listened to and felt the wind shaking the building. By the time Monday morning came around there were conflicting reports about the damage that the Typhoon caused throughout the country, especially in the south. I read that roads were flooded or blocked with debris. I heard that a hospital in Kaohsiung had exploded, however that seems to be untrue. Regardless, I decided that even if I could get out of Taipei, the trails that I wanted to hike could very well be closed. I decided, somewhat reluctantly, to stay based in Taipei for the rest of my trip. (Taipei is an ok city; I just didn’t want to be in a city at all.) The good news is that there are a ton of great day trips to take from Taipei. On Monday I had big plans to take the train to Keelung and then bus out to a place called Bitou Cape. I headed over to the train station and bought my ticket for Keelung. As I waited on the platform for the train to arrive, about two minutes before the train was due to arrive, I realised that the Chinese characters on my ticked did not match the characters in my guidebook. I went back to the gates so that I could exchange my ticket for a ticked to the right place. However, after some “discussion” (i.e. lots of pointing and miming) with the man at the gate he assured me that I had the right ticket and I needed to run to catch the train. So I ran and got on the train. I was, in fact, on the wrong train. By the time I knew this for sure though I was already about ten minutes out of Taipei so I figured I would go for the train ride and maybe it would take me somewhere great. It didn’t. The train took me to a small industrial town on the west coast of Taiwan. (But not close enough to the coast to get to the ocean.) Upset, I got on the train back to Taipei. By the time I returned to Taipei it was late afternoon. It was too late in the day to try to get to Bitou Cape so instead I wandered around the city. It was not a great day and I was feeling pretty pessimistic about the trip overall at that point. I ended up going back to the hostel pretty early and spending the evening with my book. It turned out to be a good thing that I was so well rested that night though, because the next day was going to be an excellent adventure . . .